This companion novel to The Ninth Day and Seven Stitches is set in 1912. Sixteen-year-old Miriam Josefsohn has been groomed for a socialite’s life in Portland, Oregon, but she dreams of working in the family print shop. When her father refuses to train her, Miriam turns to the woman suffrage campaign in the last stress-filled weeks before the vote. She meets the mysterious Serakh, who inquires about an heirloom shawl with a single blue thread. With Serakh as her guide, Miriam goes back thousands of years and finds herself in the midst of an ancient struggle for women’s rights. When she returns to Portland will she have the courage to fight for her own future? "Hooray for Miriam! Just the kind of young woman I like: —curious, compassionate, intelligent, independent, and determined. Her story is told in Blue Thread, a wonderfully written novel about her struggle to be herself, to be honest, and to be just. In an intriguing blend of fantasy and historical fiction, Miriam finds the battles of the past informing her present and inspiring her future. I cheered her efforts, her courage, and her rewards— and so will you." "Ruth Tenzer Feldman does a beautiful job peering into the bonds that bring us together, tear us apart, and allow us to travel beyond ourselves." "Miriam pops back and forth between worlds: well-to-do Portland, where she makes morning calls and attends fancy-dress parties; biblical Moab; and the equally exotic, alien environment of suffragist marches and working-class neighborhoods. It takes all three to help her find the initiative, empathy and common sense to help push her toward adulthood.In the spirit of Jane Yolen's The Devil's Arithmetic (1988), with a mix of historical details about the women's-suffrage movement and early printing, tied together with a very Jewish thread of historical continuity." "Miriam must develop courage and use her intelligence as well as her understanding of her family’s dynamics. As Miriam grows from a spoiled socialite into her destiny, the author examines expectations for young women and their roles in family life both in early twentieth century society and the larger world. Blue Thread is part history lesson, part Torah study and a fast-paced fantasy and adventure, with a touch of romance. Miriam’s story is as valid for today as it was in 1912 and in Biblical times. Ruth Tenzer Feldman’s writing is beautiful, terse, and imaginative." 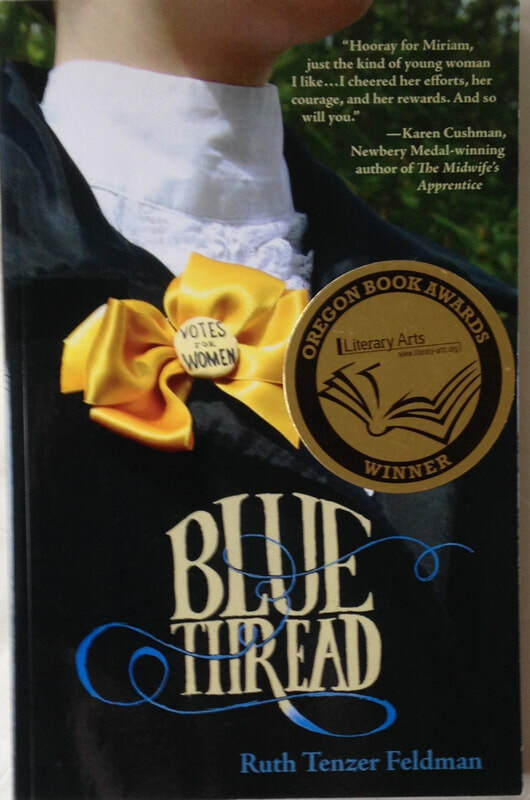 "Miriam’s journey in Blue Thread is both magical and inspiring. No doubt, like the blue thread itself, her story will be passed down from mothers to daughters—and, if there is any justice, from fathers to sons as well." "Ruth Tenzer Feldman has created a rare gem—: a story that looks into the heart and the soul of the suffrage movement in Portland, Oregon a hundred years ago."